On Wednesday, December 22, the Atlantic Council’s South Asia Center held a discussion with Gilles Dorronsoro, Visiting Scholar at the Carnegie Endowment for International Peace, and Ikram Sehgal, Chairman of Pathfinder G4S. Shuja Nawaz, the South Asia Center’s Director, moderated the session. With nearly twenty percent of the world’s population living in India and Pakistan alone, events in the greater South Asia region exert an enormous impact on the international sytem. India’s rising economic strength has been accompanied by increasing political influence, as evidenced by President Obama’s recent visit to the country in November. Pakistan, devastated this summer by the worst flooding in the country in decades, continues to play a complex strategic role in the security of the region. What were the major challenges and triumphs in South Asia over the past year? What will shape the India-Pakistan relationship in 2011? What are the prospects for a positive outcome in Afghanistan as the US and NATO begin to reevaluate their objectives for the coming year? Gilles Dorronsoro, a visiting scholar at the Carnegie Endowment, is an expert on Afghanistan, Turkey, and South Asia. His research focuses on security and political development in Afghanistan, particularly the role fo the International Security Assistance Force, the necessary steps for a viable government in Kabul, and the conditions necessary for withdrawal scenarios. Previously, Dr. Dorronsoro was a professor of political science at the Sorbonne, Paris and the Institute of Political Studies of Rennes. 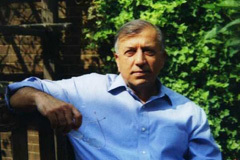 He is the co-founder and editor of South Asian Multidisciplinary Academic Journal and is the author of Revolution Unending: Afghanistan, 1979 to the Present (2005). Ikram Sehgal is a defense and strategic analyst from Pakistan. He is Chairman of Pathfinder G4S, Pakistan’s largest private security firm. A former army officer who served in the 1971 war against Bangladesh and India, he is also publisher and editor of the Defence Journal and writes a syndicated weekly column that appears in six countries in fifteen newspapers and magazines.